School administrators and staff, looking to improve the health, safety and well being of all your students? We can help through Feet and Hands-on Education for schoolchildren. School Districts throughout the country are turning to bicycling and walking as a way to improve children’s sense of independence, improve their well being, and to teach them healthy habits which can last a lifetime. We offer pedestrian education for children up to age 10, grades Pre-Kindergarten to 3. The course is divided into two sessions and designed to teach basic child-centered pedestrian safety in a fun, interactive environment. We offer bicycle education for students grades 4-12. Courses can be designed as part of the regular physical education curriculum, after school enrichment programs, school cycling club, or other after school programs. Courses can include both class in-class sessions addressing the rules and rights of the road and hands-on activities such as fixing a flat and bike and helmet fit. On the bike activities range from playground or parking lot skills drills to on-street riding. 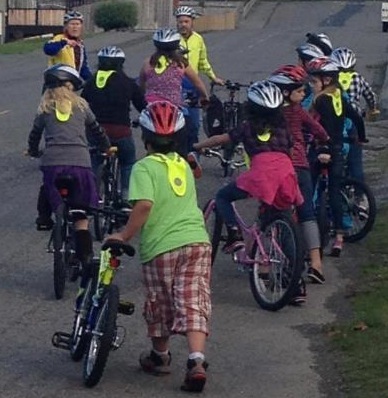 Looking to Create a Bike and Pedestrian friendly school site through policies and grants? -We can evaluate your site with a bike-ability and walk-ability audit. -Make recommendations for parking lot design and flow. -Evaluate location of bike racks, look at bike security issues. -Evaluate staff bike storage and change facilities. -Show you how to contact the responsible governmental agencies to address needed improvements and advise you of grant opportunities. *Pricing varies, please fill out our form to get a quote.